From Very “Classic” to Very “Now” La-Z-Boy offers an extraordinary range of styles and models to fit every environment and mood. Presenting both Stationary and Reclining (no “handle” on these) Models, each Designer’s Choice displays beautiful fabrics, smooth, elegant leathers, and unique wood trim accents of varying finishes. Available options to further customize your selection, include Contrasting Fabrics (on select styles), Nail Head Trim choices, Contrasting Welts, and Arm Cap/Headrest Covers. 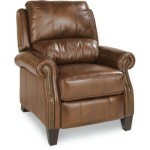 Let the distinct elegance of this recliner enhance your home. 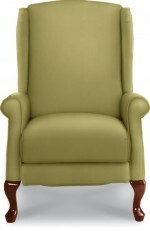 Softly tailored wing-back styling with padded roll arms and graceful cabriole legs. Sink in to the sumptuous leather of the Tarleton reclining chair. The shapely arms feature brass nail head trim that leads to wood legs finished in a rich brown mahogany. The only thing this chair is missing is you.